My five-year-old nephew is a builder. I don’t mean with blocks or Lego. No, he tackles larger projects. The backyard is the scene of his various undertakings, most recently (and as a birthday treat) he built a dam – grandparents, concrete and pipes were all involved. Apparently it was his best birthday ever. I think he needs these for Christmas: ImagiPlanks. Not surprisingly, ImagiPlanks come to us from a dad, Scott Moore, who watched his children play with scrap wood leftover from the cubby house he had built for them (a more grown-up equivalent of a baby playing with the box rather than the toy that was in it!). Moore realised that building your own fort is part of the fun and invented ImagiPlanks. ImagiPlanks are essentially interlocking planks that can be used to build all sorts of things, from forts and bridges to slides and see-saws. There are no hammers and nails involved, so they are safer than mucking about with bits of two-by-four. 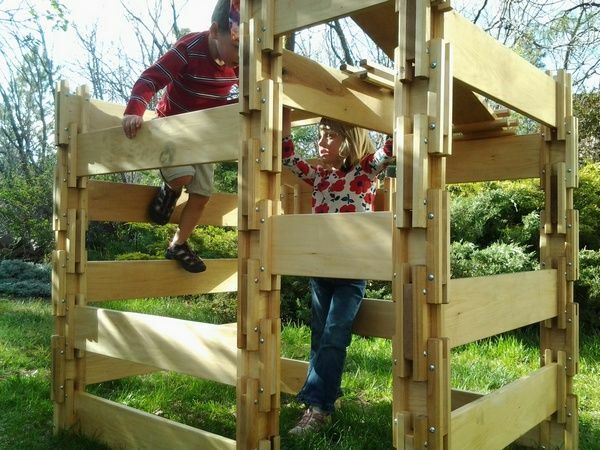 Better yet, the planks can be reconfigured over and over so your kids are unlikely to outgrow this toy in a hurry. At this stage, ImagiPlanks are only available in the United States (priced from US$239.95 for a ten piece starter set), so a freight forwarder would be required to get them too Australia. Of course, we’ll keep you posted if they become available here.